As it turns out, construction can be very appealing. 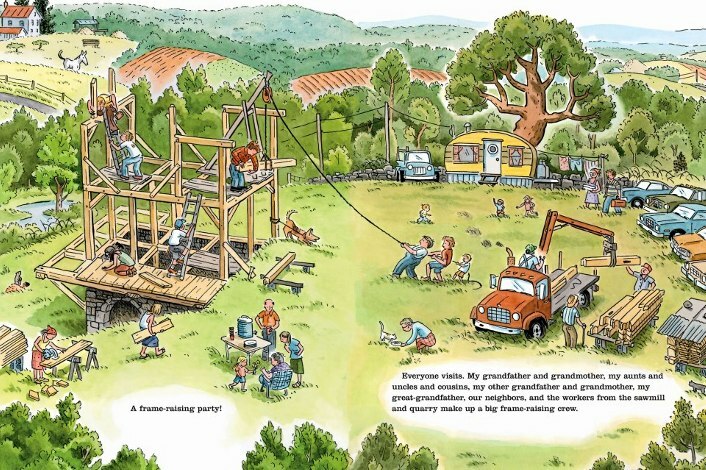 This book makes me want to build a house. Every time I see it, I can’t help but wonder what I’m doing spending my days here in this city when I could be measuring lumber or raising the frame in a remote field somewhere. Building Our House is the story of a family and the house they build together. It narrates everything from their arrival in a weedy field to the day they invite their friends and family to help them move in. In between, there’s concrete and lumber, a backhoe and a cement mixer. There’s hard work every day and in all weather. There are endless fetching and carrying jobs for the family truck, Willys. The children get older, the cat has kittens, a new baby is born. And a house slowly rises from the ground and becomes a home. It’s a true story, too. Before Jonathan Bean was born, his parents decided to build a timber-frame house from scratch. The project took them five years, during which Jonathan and two of his three sisters were born. Building Our House is told from the point of view of Jonathan’s older sister, who experienced it all from start to finish. Everything about this book makes me feel so warm and fuzzy inside. 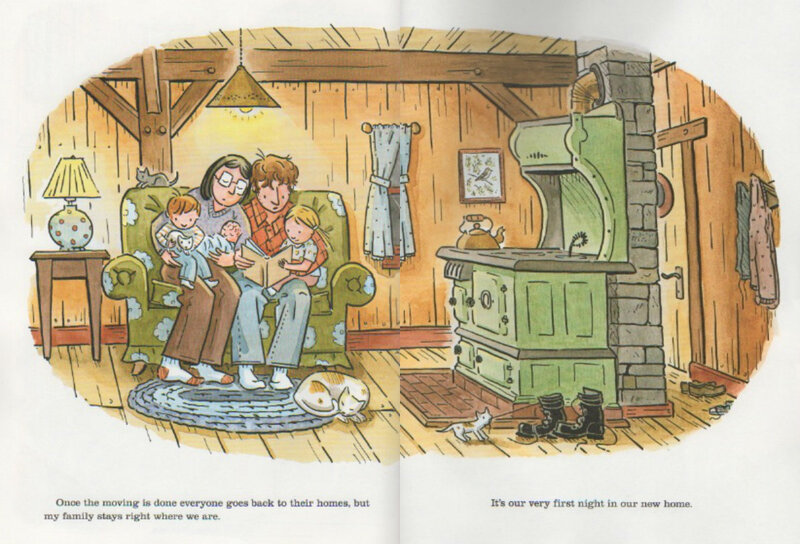 The illustrations (even the ones depicting snow and sleet and freezing rain) are cozy and inviting. The family is quirky and adorable. And the house, well, I wish the house were mine. This entry was posted in August 2014 and tagged August 2014, building our house, houses, jonathan bean, kidlit, picture books, Tattered Cover. Bookmark the permalink.